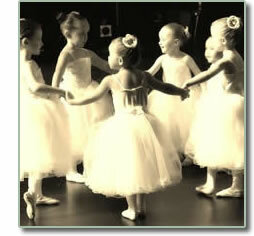 The Early Dance division at the Academy is joyful, healthy, and wholesome and includes Creative Movement, Ballet/Tap and Acrobatic Tumbling (for 2-3 year-old students) and two progressive levels of Pre-ballet, Pre-tap, Pre-jazz and Acrobatic Tumbling (for 4, 5, 6, 7 & 8-year-olds). These classes expose students to the joy of dance through movement games, creative exercises, exploration of dance styles and an introduction to movement vocabulary. Children flourish in a positive atmosphere of self-discovery while learning a curriculum that introduces the basic concepts of ballet, tap, jazz and acrobatic tumbling. These classes promote musicality and rhythm, and instructs foundational and fundamental dance techniques. Preparatory Ballet Technique classes (for students age 8 and up) are the foundation for training at the Academy and focus on developing a solid ballet technique with emphasis on understanding correct body placement, proper use of turn out, coordination of the upper body (epaulement), and use of arms (port de bras). The Academy’s unique syllabus exposes students to aspects of traditional Cecchetti (Italian), and American techniques. Class begins with work at the barre to build strength and coordination, followed by center exercises, culminating in a grand allegro combination or variation. Clear explanations of exercises and theory help students use the ballet vocabulary in a simple, practical way that leads to increased technical understanding, healthy physical development, and lifelong enjoyment. Students 11 and older with strong ballet technique, sufficient core and ankle strength, and a teacher's recommendation go on to study 'en pointe'. Tap Dance is a timeless art that combines dance and percussion. Tap dancers in musicals, movies, television, commercials, and concerts inspire us with their infectious rhythms. Tap Dance classes (for students age 8 and up) explore the two traditions of rhythm tap (hoofing) and Broadway tap. Class begins with warm up exercises in the center that increase control, coordination, and rhythm, followed by across the floor exercises that teach dynamics, shading, phrasing, and musicality, concluding with extended rhythmic phrases and improvisation exercises. The goal is to develop tap dancers that are equally strong musicians, dancers, and performers. Jazz is a dance form that appeals to everyone because of its energy, variety, and vitality. Jazz Dance classes (which students can begin at age 8) explore contemporary and classic jazz dance, rooted in the vernacular (social dance) forms, that draws inspiration from a wide range of music including jazz, swing, blues, pop, soul and funk. Academy jazz classes begin with a warm-up to develop strength, flexibility, correct alignment and coordination, followed by progressions across the floor, and culminates in extended dance combinations. The movement explores a range of styles in both lyrical and percussive disciplines with a focus on jazz elements such as isolations, swing, and rhythm. The goal is to develop dancers who are expressive, dynamic, musical and passionate. Modern Dance (or Contemporary Dance) appeals to the creative, artistic soul in everyone because of its expressiveness and freedom of individuality. The Academy’s Modern Dance classes (for students age 8 and up) introduce students to elements of Horton, Graham, & Limon techniques and focus on movement from the inside out, encouraging use of breath, energy, and connection. A warm up of breath and energy work, followed by exercises that emphasize extension, release, weight, momentum, and force, culminate in long movement phrases and improvisation exercises that playfully explore movement possibilities. 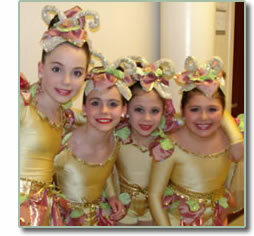 The goal is to develop strong, versatile dancers that can intelligently handle any dance style. The Acrobatic and Floor Gymnastics Program at the Academy (for students age 8 and up) teaches students fundamental Acrobatic and Gymnastic moves that are performed on low beam, props and floor mats. This program also incorporates basic Rhythmic Gymnastics skills with hoop, ball and ribbon and does not include any Gymnastics with bars or high beams. Sample moves include front, back, and chest rolls, head, hand, chest, and elbow stands, back, front and side bends, cartwheels, back and front walkovers, back and front handsprings, contortion poses, etc. Students learn flexibility and strength while acquiring valuable skills that can be used for cheerleading, dance team and competition dance.